Old Bus Photos » S.H.M.D. 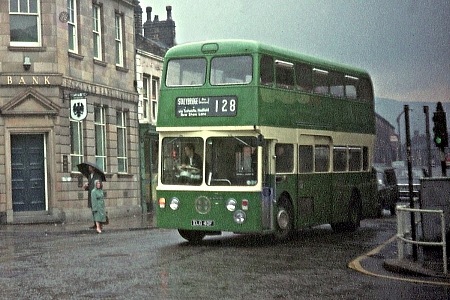 It’s August 1968 and a wet day in Glossop. One of SHMD Board’s recently delivered Walsall inspired short dual entrance Fleetlines is about to turn at the traffic lights outside the Norfolk Arms on a 127 to Stalybridge. North Western’s Glossop Depot is further up the road behind the Fleetline. These buses looked quite elegant in this livery but were totally unsuited to the SELNEC orange and white applied after the PTE takeover. Note the Rotavent ventilators in the side windows in lieu of sliding top lights, these were very much in vogue at the time. The introduction of the V shaped lower deck windscreen changed a plain and fairly dull NCME design into something much more attractive compared to the full sized vehicle of previous deliveries. Why SHMD went to a smaller vehicle when every operator around it – even Stockport – had gone for something bigger is a question I can’t answer. The narrow front door wasn’t particularly well liked but the vehicles performed reasonably well in service and I agree, the SELNEC scheme ruined the overall look. It’s an odd combination, with folding front door and a sliding one amidships. I have a bought view of a "C" suffix unit from this fleet, and it has only a cream stripe below the upper windows – above the indicator display. This looks far better. This was a strange vehicle design contrived by the innovative Edgeley Cox at Walsall where a large fleet of this type was operated. Was there some relationship between the managements at SHMD and Walsall to cause SHMD to choose these vehicles? I have always rationalised the concept in my mind on the basis that the narrow front door would be used as the entrance if the bus was working one man but could be kept closed and the centre door used conventionally for entry and exit if a conductor was on board just like a normal forward entrance front engined decker. Anybody know if this is right? It is interesting that SHMD also had a history of innovation with the centre entrance Daimlers and of course the solitary double deck Atkinson in the mid-fifties. I understand these were inspired by a GM who had been at Blackpool, the spiritual home of centre entrance double deckers. All this adds up to show what powers the municipal GM’s seemed to have in those glory days in including individual quirks into new vehicle specifications. Philip is correct about the idea behind the door usage. I’m not aware of any direct link between SHMD and Walsall and it would be interesting to see the minutes relating to the decision to purchase the vehicles. Presumably these are archived by Tameside MBC if any one has access. Were Walsall heavily into short Fleetlines? I remember seeing one/some with no front cantilever. I can’t remember how/where the driver sat! I am often in these congested days puzzled as to why passenger numbers fall and bus sizes rise…. Walsall had 99 short Fleetlines. The first was only 25′ 7" with no front overhang and an entrance behind the driver’s position pretty much the layout adopted by forward entrance front engined vehicles. The next 29 were of the same layout but were 27′ 6" with a front overhang. All of the above had wrap around windscreens on both decks. The next 69 were 28′ 6" long and were identical in looks to the SHMD vehicles. A comprehensive set of photos can be found by searching Walsall Fleetlines on Flickr. The last supposed Fleetline, actually the unique Daimler CRC6-36, went to to the other extreme with a 36′ length and two staircases. Thanks Phil for confirming my theory on the entrance/exit concept. I always feel that Edgeley Cox was to the bus world what Oliver Bullied was to railways. Both were great innovators and must have been strong personalities in that they got their employers to adopt large numbers of very unusual vehicles (locos in Bullied’s case) where a more standard solution would have almost certainly made more commercial sense. Sorry to digress into the world of flanged wheels on this site but the parallel has always struck me. Since the current posting has mentioned the Walsall short Fleetlines buses I thought you may like to see a couple of shots taken of the preserved Walsall vehicle, which is part of the Wythall collection it was used in 2010 to celebrate the end of trolleybuses in Walsall by following most of their former routes. I’m not "into" buses but came across the article on S.H.M.D. Fleetlines, the last six of which seemed to be used a lot on 2-man services like the 125 in the ’70s. Were these buses sent to Glossop after the P.T.E. absorbed the North-Western operation there, to replace the Renowns on conductor-operated routes, while the earlier,’conventional’, 56XX Fleetlines were cascaded out of the area to depots like Leigh-perhaps to replace A.E.C.s there in a similar role? Does anyone know if the ‘preserved’ S.H.M.D. Fleetline that was being kept at Mossley (I think) still exists? On the last point, I can confirm that Fleetline number 28 is still there, along with PD2 number 5. The name of this operator is shortened to S.H.M.D. thankfully, its full name was as follows “Stalybridge, Hyde, Mossley and Dukinfield Joint Transport Tramways/Transport and Electricity Board” (see comments below). Stalybridge, Hyde, Mossley and Dukinfield are 4 towns to the east of Manchester. This Daimler had an East Lancs body which was a rare thing as to say they preferred Northern Counties would be an understatement. S.H.M.D. 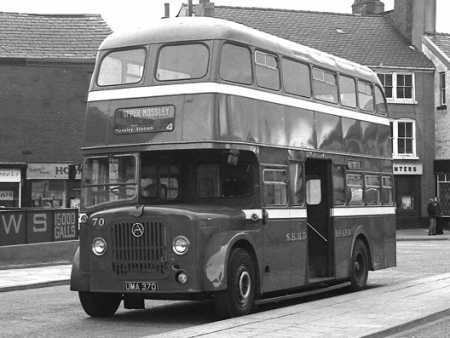 got together with Atkinson and Northern Counties and in 1955 the only Atkinson double-decker ever built went into service but nothing ever became of the venture and in 1969 it passed over to SELNEC. The Atkinson ‘decker No. 70 (UMA 370) was restored at Stalybridge on withdrawal and presented to the Greater Manchester Museum of Transport, where it still lives. It does come out from time to time and still goes well. 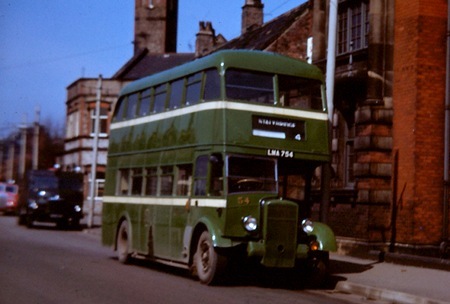 SHMD had ten of those East Lancs bodies, and ten Brush bodies just after the war; it was just a case of "grab what you can" in the post-war shortage of new buses. The East Lancs bodies must have been good as they lived a full life; the Brush were rubbish and were replaced by NCME ones after six years. 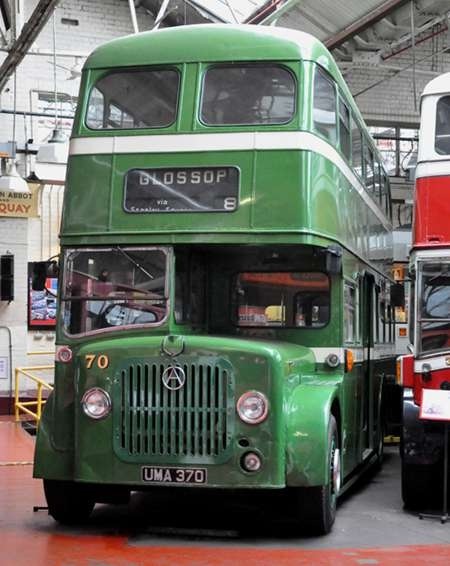 Number 70 was not the only Atkinson double-decker built there were two one which was sent to India. SHMD were on of the last operators to use centre entrance deckers buying them as late as the nineteen fifties. 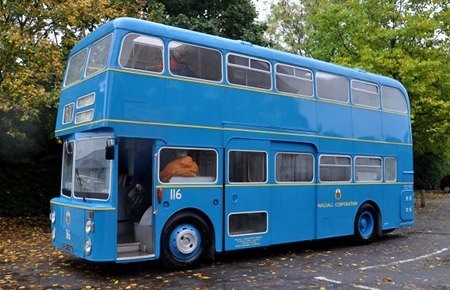 As well as the solitary Atkinson one other SHMD bus with centre entrance is still in existence being a Daimler CVG6 with Northern Counties body that lives at the Keighley bus museum. They also have a SHMD Atkinson Alpha centre entrance saloon under restoration. I was one of the last two apprentices to be taken on by SHMD in 1968, and have worked on the No70 bus along with a host of others. If you need any further information re SHMD please contact me through this site. Please note that you have fallen for the common mistake of including the word "Joint" in describing the full name for the SHMD. It was always the "Stalybridge Hyde Mossley and Dukinfield Tramways and Electricity Board". The trams themselves did show various nomenclatures such as "Joint Board" and that was the term commonly used among local passengers at the time. But the word "joint" was never part of the official name. I am sorry that you did not think to check this out before posting this on-line. I agree that the word Joint didn’t appear in the official title, but it was not "always" Tramways. The name was changed to Stalybridge, Hyde, Mossley and Dukinfield Transport and Electricity Board in 1936. 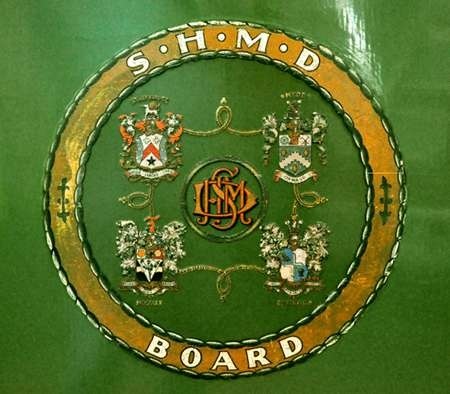 The buses originally carried an "SHMD Joint Tramways" fleet name which then became "SHMD Joint Board" but this was later shortened to "SHMD Board" until the longer title was adopted in much smaller lettering in the early sixties. Once the device was adopted, for some reason as a general rule double-deckers had the multiple coats-of-arms device between SHMD and Board whereas single deckers only had the lettering. OK, so I was lazy in saying the title was "Always Tramways etc. ; I know it changed to "Transport". And of course it always included "and Electricity" even after that responsibility was lost, but that bit was dropped from the full title as shown on the vehicles in later years. The point I was making was that, though everyone in the area always called it "the Joint Board", and that was an accurate description of its legal status and function, and the term was used on the vehicles, it was never the legal name of the organisation. That was enshrined in the Stalybridge, Hyde, Mossley & Dukinfield Tramways and Electricity Board Act of 1900. Because everyone knows it had the longest name in the business, everybody seems to want to embellish it unnecessarily with another word to make it sound more eccentric! "The Old Thirteenth Cheshire Riflemen Voluntary Corps Inn"
I’ve seen this with extraneous words added by helpful admirers too! A bit of trivia, in John Schlesingers film ‘Yanks’ the decker used in an early scene the conductress’s hat badge reads ‘Stalybridge and District’ why they didn’t use SHMD I don’t know as the continuity in the film was quite good otherwise. I remember the Crossley Omnibus Society – or maybe its BWBE predecessor – running a tour with no 70. I don’t remember where we went (probably somewhere in Yorkshire) but I do recall it was a very nice bus to ride. My other strong memory of the SHMD is a ride on the Haughton Green – Hyde service on an ancient Daimler which had a rope bell. I had heard about these being used on some old trams, but it’s the only time I remember seeing one on a ‘modern’ bus. SYPTE specified rope bell-pulls on its Leyland Atlanteans and Dennis Dominators – in First Bus days one of the Dominators was allocated to First Calderdale. I have just had a great time looking at the pictures and reminiscing about "the good old days" I was a fitter at the depot on Tame Street along with Andy Roberts. I will try and dig out some old photos and post them. Some early trams were fitted with electric bells according to Hyde & Ogden in their SHMD Board book. These gave trouble and were replaced. Manual bells were fitted to buses using a continuous jointed leather thong. 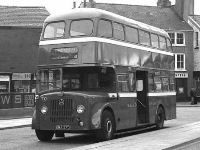 The Daimler demonstrator double decker 168 delivered in 1936 had but two bell pushes in the lower saloon, which the conductors found insufficient. When incorporated into the fleet it was fitted with the continuous thong bell which on double deckers ended over a pulley and hung down on the platform of double deckers. In the older vehicles the thong was looped through the grab rail along the ceiling, later buses had holders provided. 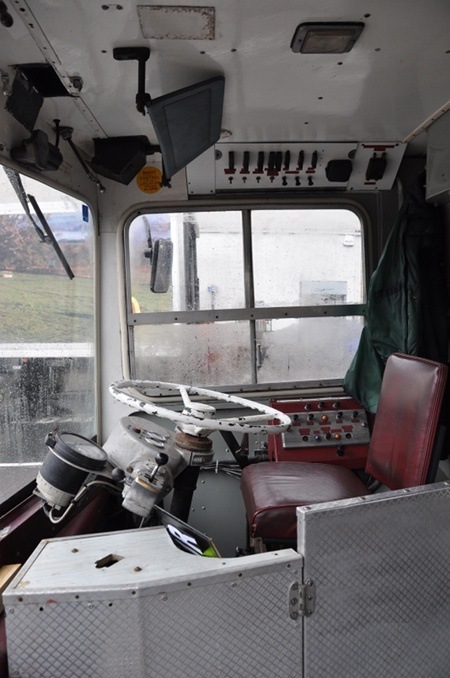 I think more modern buses were fitted with m continuous bells connected to an electric bell in the cab. Upstairs the original Daimler double deckers had a single pneumatic bell at the top of the stairs, with a more modern bellpush than that on the Manchester trams. I recollect that Liverpool’s older trams had a flat strap bell along the middle of the ceiling of the lower deck. The Daimler demonstrator of 1936 is referred to in Hyde & Ogdens fleet list as : fleet No 168 Reg No BWK 860. Daimler Chassis COG6 with Weymann Body. Withdrawn 1950. Is this the same as the Daimler CVD6 referred to in your appended comment ?